Vanguard Marine & Leisure are underwriting managers specialising in providing insurance solutions to the boating fraternity via the insurance broker market. The product offering begins with insurance for your watercraft and includes optional cover for the trailer/caravan and specified all risks items. Our aim is to provide the insured with the peace of mind that consistent cover is maintained for the rig whether at home, in transit to faraway destinations, weekend transit to local launches or whilst on the water. One policy not only ensures consistent cover, but also a consistent philosophy to claims. Our product and brand is sold via the insurance broker market which has not had an insurer dedicated specifically to insurance solutions for the watercraft/ski-boating customer. We provide specialist cover, service, experience and advice to all brokers, some of whom may not have easy access to a specialist watercraft underwriter. The business will be underwritten by Infiniti Insurance Limited, which we have partnered with. Infiniti is a young, dynamic insurance company, which is focused on long term partnerships with insurance entrepreneurs who are specialists in their fields. Copyright © Vanguard Marine & Leisure (Pty) Ltd 2009. All rights reserved. 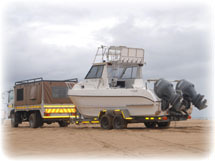 Vanguard Marine & Leisure (Pty) Ltd is an approved financial services provider.